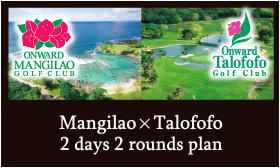 Talofofo golf course was designed by 9 legendary PGA players - including Sam Snead and Ben Hogan - with each golfer taking responsibility for the design of two holes. 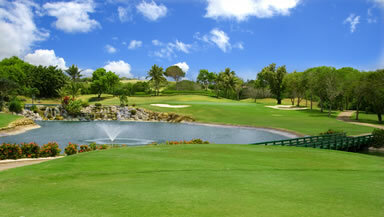 Later, Onward Group renovated it to a wonderful dream course; it was reborn, with Island Green No.5, in December 2006. 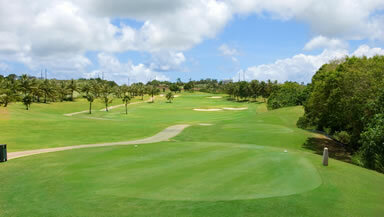 Enjoy dramatic play throughout this Onward Talofofo Golf Club designed for you by professional golfers. 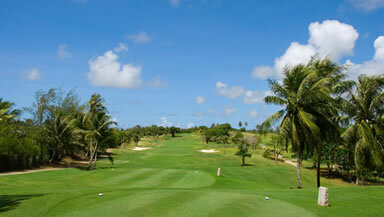 The flat and American-style out-course, with tropical flowers and island greens reflected on the surface of the waters, makes for a wholly enjoyable resort-golfing experience. 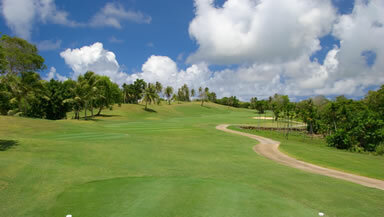 Against a background of grand virgin forest, the in-course, which makes the best use of the surrounding geographical features, is a section where players enjoy strategic challenges. 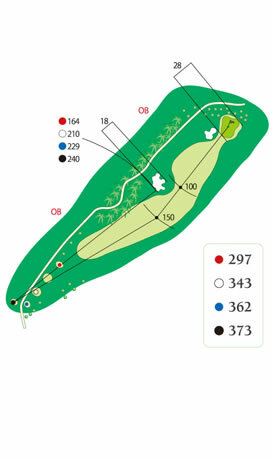 Each hole has yardage markers planted in the ground, measured from the teeing ground to the center of the green. 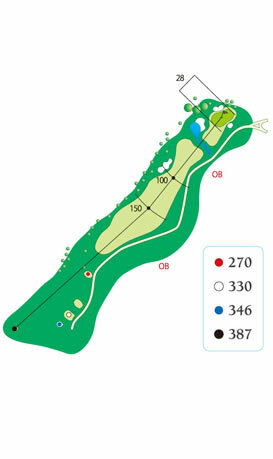 The remaining distances from the green to the fairway are marked with round plate markers and the rough is marked with distance markers in the shape of latte stones. Only persons with a valid driver’s license will be permitted to operate a golf cart, within the area of a golf cart lane. Golf carts must only be used on golf cart lanes. Please do not ride them off-lane. Please operate the golf cart safely – reduce speed while going downhill and while driving after rain. 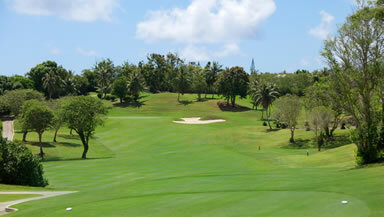 Tee off at a long hole along the broad fairway where an eagle opportunity is possible. A centered tee shot followed by a 2nd shot onto the right side of the fairway would give you a favorable opportunity to get home in 3. If you have confidence in the flying distance then the tee-shot should be positioned over the right-side bunker, and if the 2nd shot avoids the left OB, you may aim for an eagle. The rear side of the vertically long green is a risk-free area. 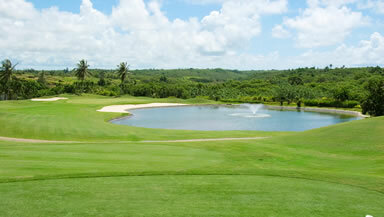 A short hole, with a beautiful lake and beach bunkers located on the front-right of the green. Precision shooting is required even in the wide-open green area. When the flag is on the right then a perfect shot right over the lake is required. However, careful attention should be given to wind blowing from the right side of the green as the left side of this hole is OB. 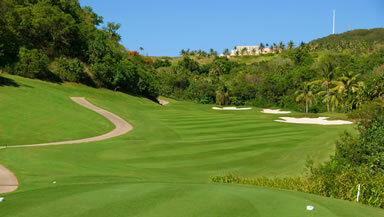 The green slopes downwards from the rear to the front and has a gently undulated surface. 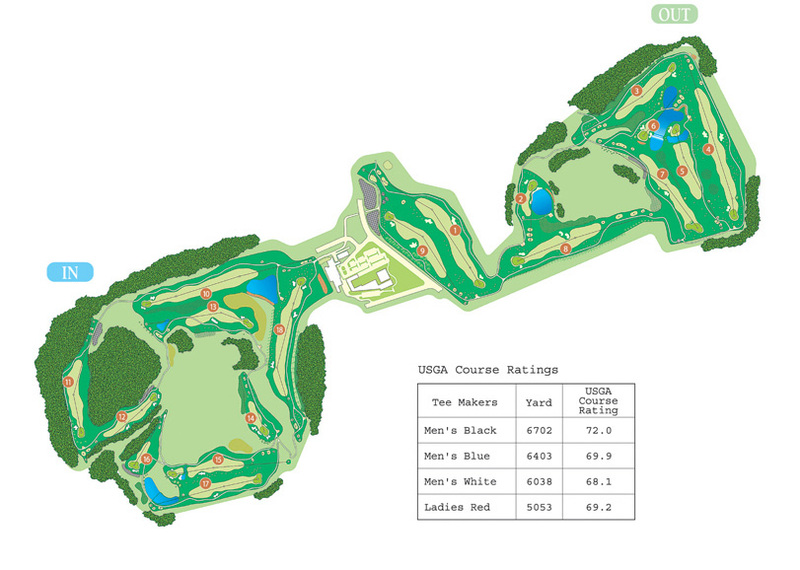 A middle hole, with a downhill tee shot followed by an uphill approach. 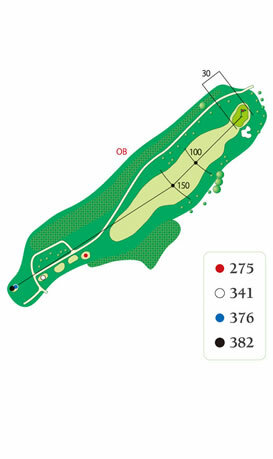 The second shot to this green is not easy, especially with trees located on the left side of the fairway and the left OB, and thus the tee shot should be positioned a little bit to the right of center. 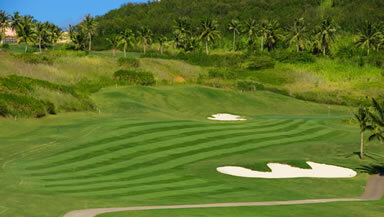 Taking one more club, the second uphill shot should be positioned to the apron avoiding the right-side bunker. 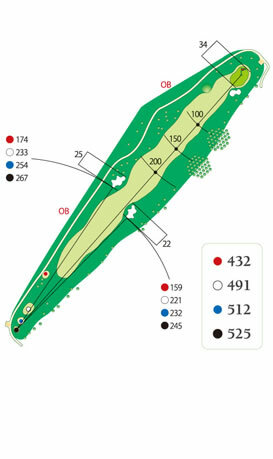 The smaller, elevated green is flat. The rear side is safe. A straight, wide and long hole. 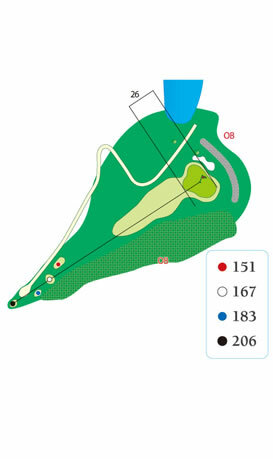 From the teeing ground - which gives you sweeping views of hole 5, surrounded by a lake, and hole 6 - the tee shot should be positioned centrally, avoiding both right and left side bunkers that guard the fairway. The second shot should be positioned slightly to the right, away from the left-side tree (Taotaomona). 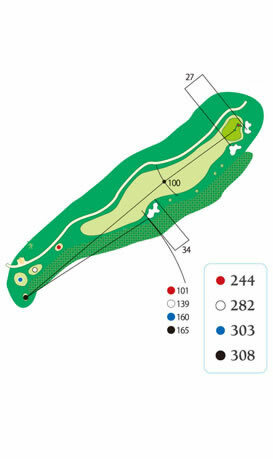 The ideal putting positions is from the front towards the rear of the vertically long green. 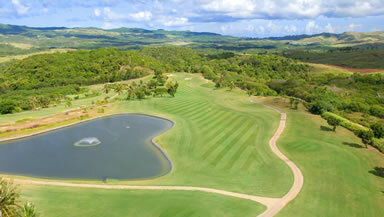 This featured hole is short-distanced yet challenging due to the island green. 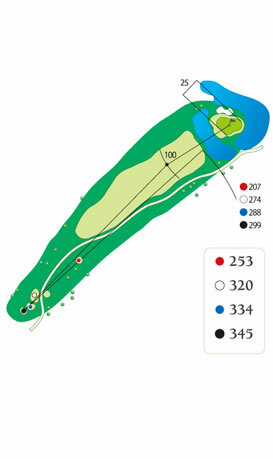 The tee shot should be positioned to the center of the wide-open fairway. The large Downhill (16m) has a following side wind. A pond is 295 yards from the blue tee. Improving your distance as far as possible and then using the carry of your best shots to get home in 2 are keys to success on this hole. 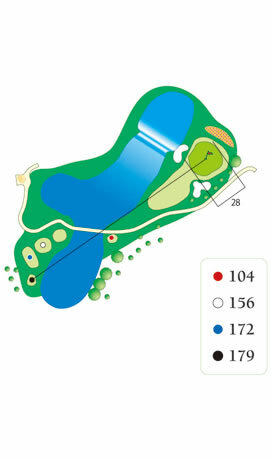 It has a flat green with a small shelf in the rear side, but with the lake waiting at the rear, going over the green should be avoided at all costs, and a precise lob shot is a definite requirement. This is also a featured, short-distance, hole, with a waterfall reflecting “Talofofo Falls”, which is a noted tourist spot in Guam. Strong following winds are often present. 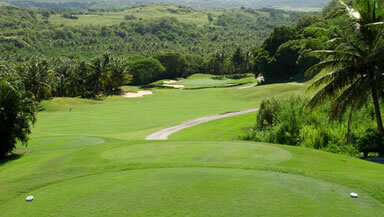 The green tilts upwards from the front to the rear with a slight undulation. 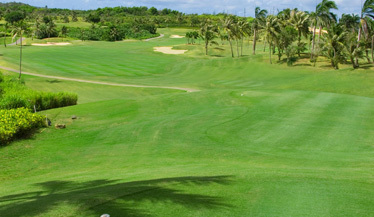 Dogleg gently right towards the mid-distanced hole with the green which is divided in two by a large, stout tree called “Taotaomona” (a sacred tree in Guam) planted squarely in front of the green. Get a head start with a tee shot to the left side of the fairway. Taking the right side of the fairway gives a higher possibility of running into trouble. 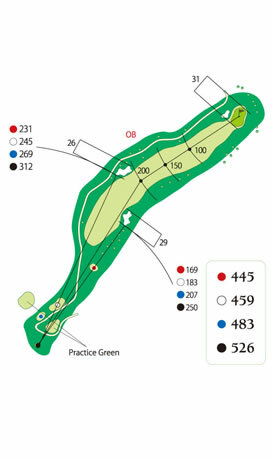 On the green, which is big and vertically long (60 yards) from the rear-left to the front-right, checking the position of the pin is important. If the position is misread, you could end up with an incredibly long, over 130 ft., putt. A long-distanced, mid-hole. Following winds are constantly present, but it is hard to get home in 2. The tee shot should be positioned to the left side of the bunker. Long-distance players have the potential of a clear shot over the bunker, paying careful attention to avoid the right OB. 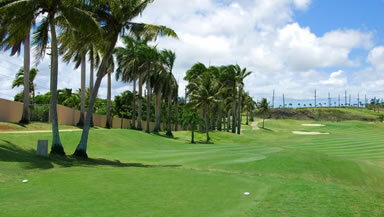 Palm trees planted on the left side could get in the way of the second shot. The vertically long double-tiered green has a 50cm difference in height, which is fast from the upper end. 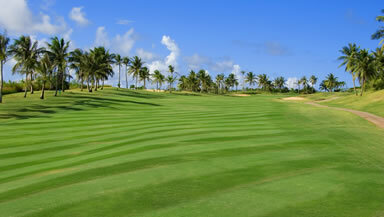 This is a wide and straight mid-hole with a beautiful grove of great, big royal palm trees planted on the left side. 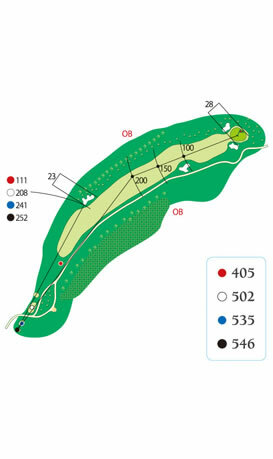 The tee shot is positioned to the right of center, avoiding the fairway bunker, which makes finding a favorable position on the green from the second shot easy. 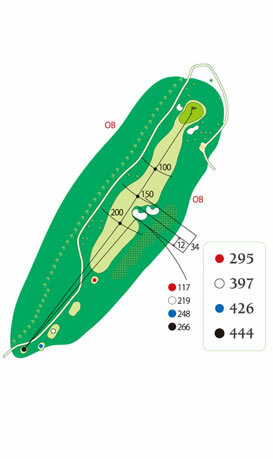 Attempting to hold shots on the green is difficult as it slopes downward from the rear–left to the front-right. This scenic long hole has a wide downhill. 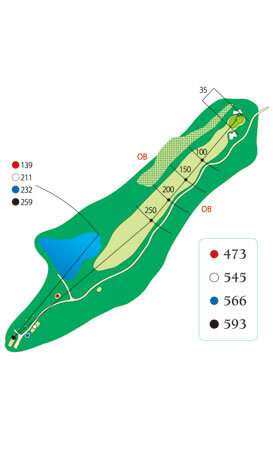 Get off to a better start with the tee shot positioned a little bit right of the center of the fairway, using the fact that the right OB is far, and avoiding a lake on the left side. The second shot should be hit to the center. The nearer the green, the nearer the right OB gets, so a precision shot is a must. As on this downhill lie, your left shoulder will be a bit lower than normal at address, so long-distanced players will require all their skill. It would be easier to get home from the vertically long apron. The green slopes slightly from the rear to the front. 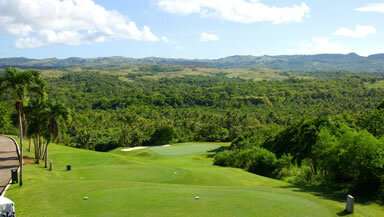 This mid hole has a dynamic downhill (20m) with a virgin forest of palm trees stretched out in the foreground. The tee shot should be positioned to the extremely large greenside bunker in front. The fairway tilts to the right. A slice would be driven with a high probability of OB. 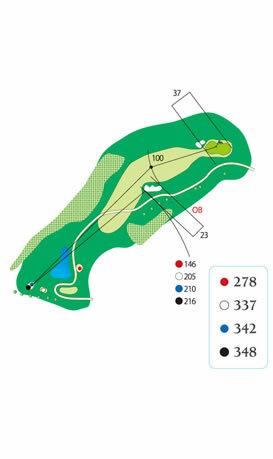 The second shot should be positioned to the left of the green avoiding the greenside bunker on the front-right. The vertically long green slopes downwards from the rear and a little bit to the right. This mid-distanced but tight hole requires a precision shot rather than the carry. The entire right side of this hole is OB, so the tee shot should be positioned to the left of the center. An OB line close to both sides makes the second shot hard. Approach shots must be positioned accurately to the center of the green. Due to the small green, the second shot requires careful attention to one’s depth perception. There’s no margin for error. This mid-distanced hole has a right dogleg. 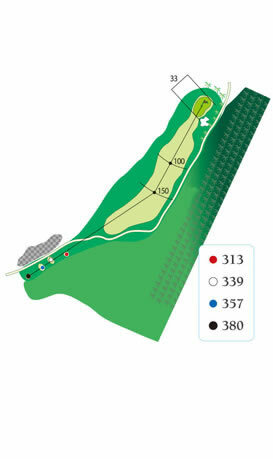 The tee shot should be positioned to the left side of the fairway. The second shot would then be hit uphill using one more club. Subtle undulations make this green difficult to putt depending on the position of the flagstick. A short, downslope hole, surrounded by 4 bunkers. With the rear side undulation tilting to the left, pay careful attention not to get over the pin on the green. 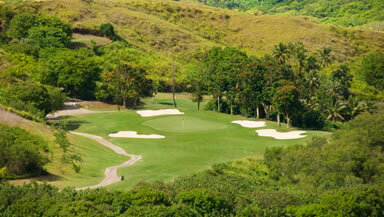 This downhill (20m) mid-hole is short yet challenging, as a creek and beach bunkers guard the way. The tee shot should be positioned right of center, avoiding the left bunker. The creek is 300 yards from the blue tee. The forceful wind demands a wise club selection. 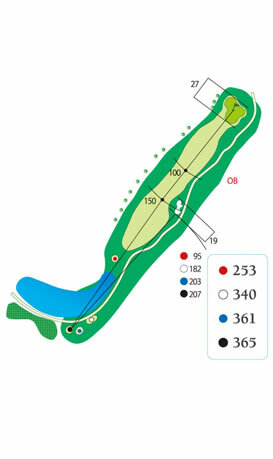 The green tilts from the rear to the front-left, so the second shot should be positioned to the very right side depending on the position of the pin. This short hole is another large downslope (25m). A following wind is forever present. There is a deep bunker behind the green, which has OB on the right and rear sides. Hit a shorter club to the apron. The tilted-green is divided into three blocks. This mid-distanced hole has a big uphill (20m) where head winds are often present. 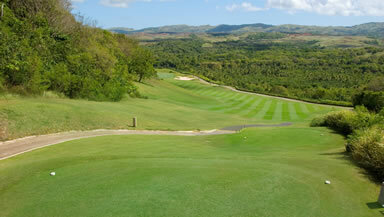 The steep uphill encourages a long tee shot positioned to a little bit left of the center. The entire right side of the fairway is OB up to the greenside. A triple-tiered green demands your full attention. The front side is the 1st stage, the rear-right is the 2nd, and the rear-left is the 3rd. When the pin is on the upper stage, one more club should be taken. 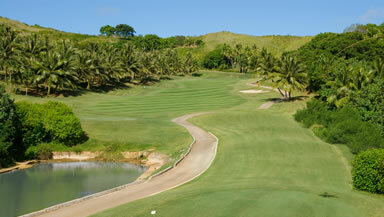 A finishing hole, this Par 5 has a gentle upslope (15m) and a long-distanced dogleg right. The green is not in range of sight at the tee ground. 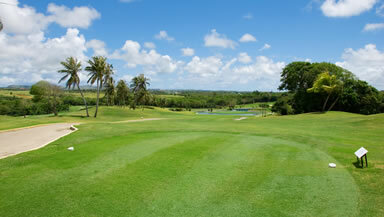 The tee shot should be positioned to the right of the center of the wide-open fairway. 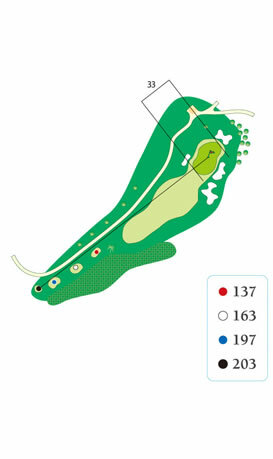 The second shot should then be hit at the club house site on the hill. Even big hitters hardly hit the green regularly into the wind. 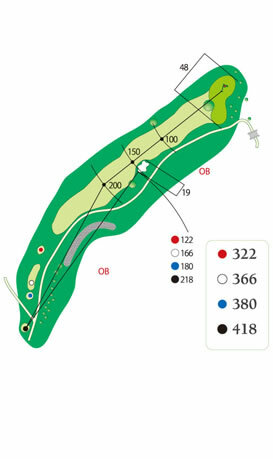 Due to the tilted green, getting home in 3 with shots positioned to the apron will give you a chance for birdie. Sam Snead 82 career wins on PGA TOUR including 7 majors. Ben Hogan 64 career wins on PGA TOUR including 9 majors. Gene Sarazen 39 career wins on PGA TOUR including 7 majors. Gene Littler 29 career wins on PGA TOUR including 1 major. Billy Casper 51 career wins on PGA TOUR including 3 majors. Doug Ford 19 career wins on PGA TOUR including 2 majors. Moody 1969 US Open winner. 11 career wins on SENIOR PGA TOUR. 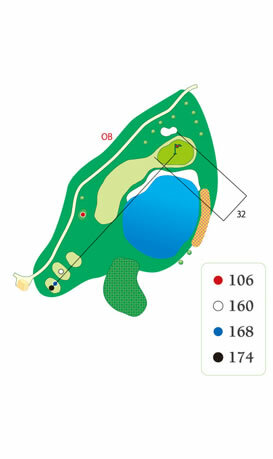 The entire course including NO.5 Island green has been improved to be more beautiful and strategic, whilst keeping the designs of PGA professional players.